Is my Jesus too white? This is the image of Jesus that stands over the chancel area of our chapel. It is a beautiful stained glass image that has a long, rich, beloved tradition here. And it has, at its center, the focal point, a very, very white Jesus. This may or may not be an issue to anyone who reads my blog, but it is apparently an issue for some of my congregation. Less than half of those typically in attendance on Sunday morning are Anglo. Whatever Jesus might actually have looked like, I don’t know many people who would claim he looked much like this particular image. Some would reply with something like, “it isn’t important what Jesus actually looked like, or what color he was, so this isn’t an issue.” I agree with the former, but I am really not so sure about the latter. It does matter if a person, upon seeing this image, immediately thinks he or she is left-out, de-valued, less-acceptable merely because of color. 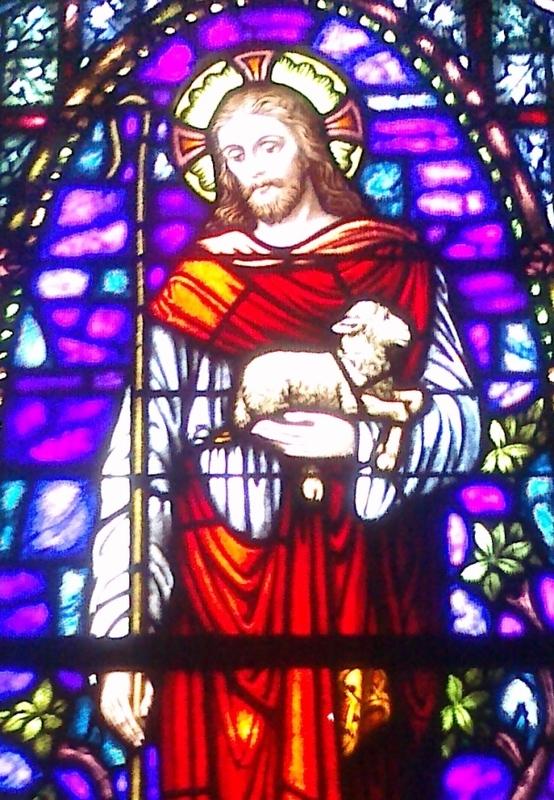 Now, other than this stained-glass image, is my Jesus too white? Do I imagine Jesus as a comfortably well-off, over-educated European-American? How about your Jesus? How much like you is your Jesus? I actually think this is very important to talk about, not just from an artistic point of view, but from a deeper theological view of how we portray Jesus (by what we teach, say, emphasise etc). I also find this a great question as someone who has a LARGE amount of family from the Middle East (mainly Lebanese and Syrian on my wife’s side). I want to comment in particular about the Jesus you have in your picture. 1) He looks pretty middle eastern to me. His nose is not really small, and to be honest he could pass for a member in my wife’s family. There are many in the Middle East that are not as ‘dark’ we might think. My father in law has hazel eyes in fact, and her uncle had blue eyes until they changed to hazel later in life. So the idea of a ‘blue-eyed’ Jesus wouldn’t even be necessarily wrong. Improbable, but not wrong genetically speaking. So as far as features go, I don’t see the Jesus in this stained glass to be European per se. Now, when it comes to colour of skin there is one matter of art that should be remembered. I say this as a novice in art, and by no means an expert who has a long history of how this came to be or anything like that, but I do know this much. Jesus is often painted in a way to show his divinity. Painters wanted to display that Jesus is divine. One way they did this was to portray him either with a burst of light showing forth from his face, or with a light above his head. http://affirmativetheology.com/jesus-icon.jpg as an example. This is an example of an icon from the Eastern Church, and if you google ‘icon of Jesus’ you will find that they all (at least all I have ever seen or saw then googling have this ‘halo’ of light around Jesus’ face). This is NOT to try to say Jesus is white, and in the above example Jesus looks very nonwhite, but also with the ‘glory’ of God painted. The stained glass picture you posted also has this halo effect. It also has Jesus face more bright or ‘light.’ I think there is a vast difference between ‘light’ and ‘white.’ I think one has the intimation of ethnicity while the other is an artistic rendering of the glory of Jesus. It appears your example is to show the glory of Jesus NOT to make him appear white.